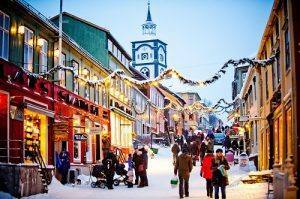 Welcome to Roros, a UNESCO world heritage site and a true winter wonderland. The trip starts with a night in Oslo, then 4 nights in Roros. 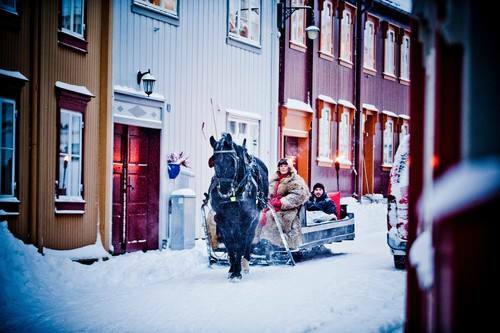 Experience a Norwegian Christmas meal, local Christmas traditions and exciting activities like dog & reindeer sledding as well as a ride through winterly Roros in an open horse carriage. 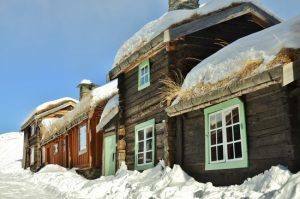 On the way back to Oslo, experience the Roros Railway and the rough and beautiful wilderness in Osterdalen. Individual arrival to Oslo. Check in at the centrally located, elegant Bristol hotel or similar. Hotel Bristol is located close to the Karl Johansgate main street, the Royal Palace & the main shopping areas of Oslo. 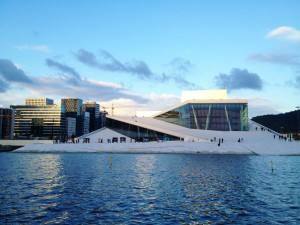 Spend 1 night in Oslo (included in tour price). Short flight to Roros from Oslo Airport. Roros is one of the few mining towns in the world to have a place on the UNESCO world heritage list. Check in at the centrally located Roros Hotel, which is only a short taxi ride from the airport. The hotel is situated only a few minute’s walk from the town centre. As a guest of Roros Hotel you can also enjoy the new SPA & wellness area. 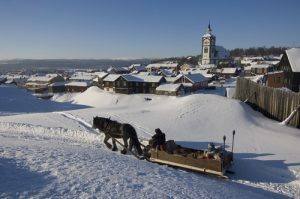 In the afternoon enjoy a journey by horse-drawn sled and learn of the incredible history behind this atmospheric village. 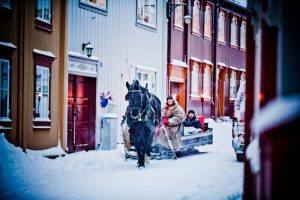 You will be drawn past the 17th and 18th century wooden houses, winding alleyways and courtyards. 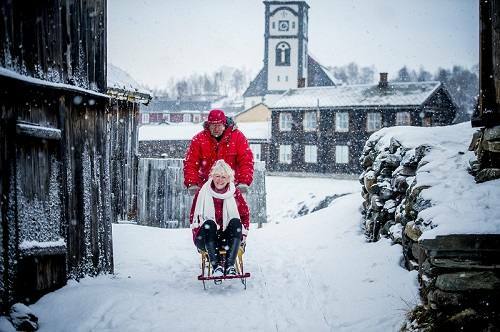 The sled will also take you past the old copper mine and the beautiful white church that dominates the skyline of the village. 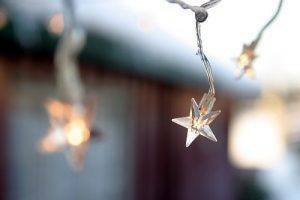 Spend Christmas in a magical atmosphere! In the late afternoon, you can head down to the iconic wooden church of Roros for its Christmas service (4pm). Afterwards, Santa will visit and give gifts to you and your family. Join the traditional dancing around the Christmas tree. 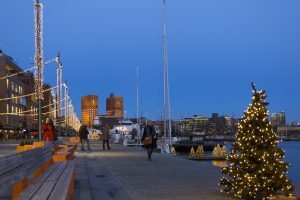 In the evening you will have a traditional Christmas dinner served from the buffet with lutfisk (cod), ribs, lamb ribs together with all the trimmings and a large dessert buffet. 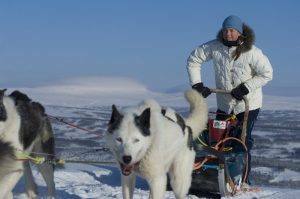 Join a dog sledding trip in the wilderness. On this 1,5-2 hour trip you are the passenger in your guides sled. 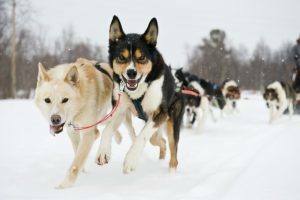 You get to experience the dogs’ tremendous job satisfaction while you travel through a beautiful winter landscape. Coffee from the bonfire and cake in our wilderness camp is included in this tour. 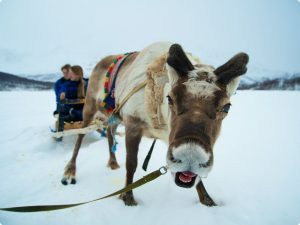 Sitting in a sled pulled by a reindeer is a fantastic winter snow experience suitable for the whole family. Reindeer husbandry has been practiced in Roros for several hundred years. 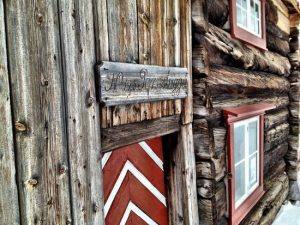 Even before the mining operation, the Sami people populated these parts. Nowadays, many Samis continue to practice reindeer husbandry and spend a large part of the year with the reindeer. 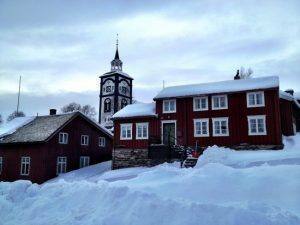 Today you have the opportunity to experience some of the Sami culture and history. After some exciting days in Roros it is time to say good-bye. On the way to Oslo you will experience Roros Railway, which runs through the rough and beautiful wilderness in Osterdalen. The Roros Railway is Norway’s oldest trunk line and was built in stages from 1862 to 1877. Change train in Hamar and continue to Oslo Airport. 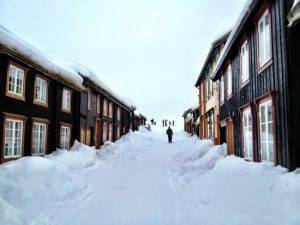 Roros is particularly popular in the winter, with its crisp white snow – a sparkling white winter dream. 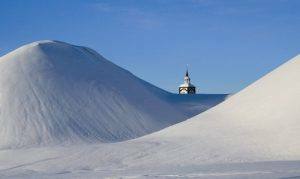 The area has a subarctic climate and it can get very cold here! The coldest temperature recorded here is −50.3 °C (−58.5 °F)! So if you are booking this trip to Roros make sure to bring warm clothes! Roros is one of the oldest towns of wooden buildings in Europe and is located on a gently sloping plateau 628 metres above sea level. The city was founded in 1644 when the first copper ore was found in the area, and over the years, Roros became one of the most important mining towns in Norway. Due to its authentic wooden buildings and unique character of an early mining town, Roros was added to the UNESCO World Heritage list. 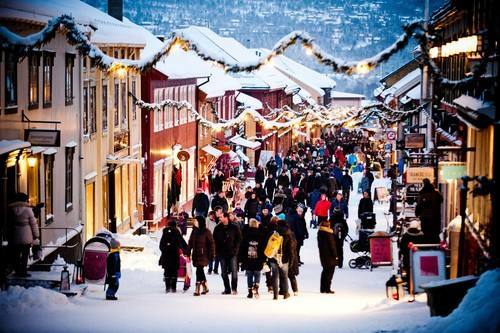 The main Christmas celebration in Norway is on Christmas Eve, and the Christmas Eve dinner is the main Christmas meal in Norway. After dinner it is still a tradition, particularly among families with children, to walk around the Christmas tree. The meal traditions vary according to the geography of Norway. In the eastern parts and mid Norway they normally eat crisp ribs of pork (called Ribbe in Norwegian), while the western parts of Norway prefer dried ribs of mutton (called Pinnekjott), with potatoes and mashed kohlrabi (German turnip). In the northern parts of Norway they eat Pinnekjott as well, while some stick to the old tradition with Arctic cod.